I’ve been doing these blogging income reports since 2015 and am always amazed at how fast online income grows…until this year. It’s not that anything has changed online or that building an online business isn’t still an excellent opportunity. 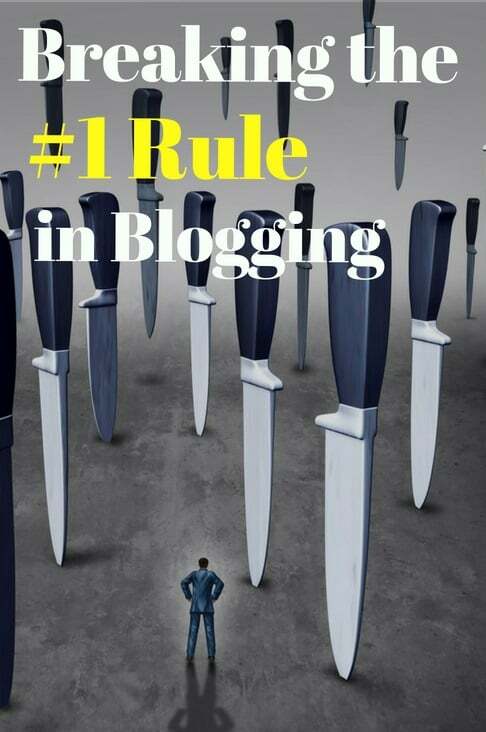 It’s that I let myself break my #1 rule in blogging, a tenet that helped me grow my business over these last three plus years. But catching the mistake is one of the reasons why these income reports are so important, not just to help other bloggers learn how to monetize a website but to keep myself accountable. These reports are how I track my business, see what works and what I need to change. Tracking my business helped double monthly income every year from 2015 through last year. It’s also helped get back on track to return to that growth. It can help you do the same. If there’s one rule that helped me grow my online business as quickly as possible and avoid the soul-crushing frustration that causes so many to give up, it was that I didn’t wait to make money. Any new blogger can tell you the chorus of ‘advice’ they hear from others, that you shouldn’t worry about making money at first. The idea goes that you’re not going to make much money anyway on limited traffic so just focus on growing your blog first. If you have one visitor to your blog, you can make money. It’s true you won’t make thousands a month immediately, but you can get to a few hundred a month very quickly. I was making $300 a month within six months and over a thousand within a year of starting the blogs. 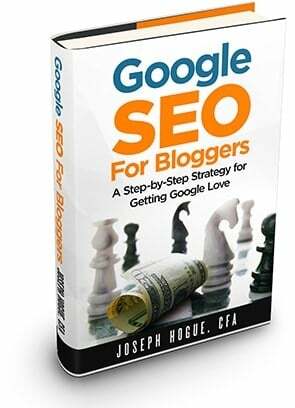 More importantly though is even those little checks are going to give you the motivation you need to keep blogging. You’ll see the payoff of your hard work and your business will grow. Having a plan to grow your online business is important but you always need to be thinking about making money on that business as well. After more than three years and terrific growth, I broke that rule this year. I made YouTube my big project this year to reach a new and more engaged audience. I’ve still followed a profit plan but creating new books or products has taken a back seat to publishing videos. The result, monthly income has grown just 10% so far this year versus 245% growth in the first six months of last year from the prior year. Let’s look at the blogging income sources and then I’ll show you how to grow your blog AND make money. Even breaking my blogging rule, it was still a pretty good three months with a total of $18,766 from the websites. That’s slightly below the $19,698 I booked in the first three months of the year but it’s typical because the first three months are usually the best of the year. Income from 10 books published on Amazon came it at $4,980 which comes out to about $166 per book each month. That’s slightly lower than the $180 per book I was earning through last year, so I think I need to do a relaunch for a few of the books. I love self-publishing because it’s almost completely passive income. After I launch a book, I spend between $10 and $20 a month on Amazon marketing and that’s it. I do no promotion other than sharing the books through social media and they continue to produce solid cash flow. That said, it does help to re-launch your books every couple of years because sales momentum can slow down over longer periods. I booked another $2,656 from sponsors and am expecting this number to boom in the future. Just in the last month, I’ve signed contracts with two companies that want to sponsor videos on the YouTube channel. 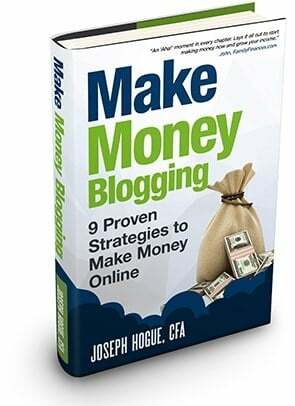 The largest income source for the blogs has been affiliate marketing which earned $11,129 for the quarter. I booked commissions from 19 affiliates through the three-month period but four of them accounted for 80% of income. The new YouTube Channel (Let’s Talk Money!) has been the real standout this quarter and part of the reason why income has grown more slowly this year. I finished June with over 7,500 subscribers and have averaged 120 new subs every day over the last three months. Videos are averaging over 1,000 views each versus blog posts that might get half that in readers if they do well. As much as I hate focusing so much on a platform that I don’t own, it looks like YouTube is really the future of the business and the main driver. I’ve already booked three sponsors for videos, two of them for packages of over $1,500 each. I’m getting much better engagement on the videos versus blog posts and the growth has been amazing. It’s always important to track your income growth as well as other metrics like traffic and blog engagement. This is going to help you stay motivated to work and give you an honest look when you’re slacking. In the first six months of 2017, I booked income that was more than double what I earned in 2016. 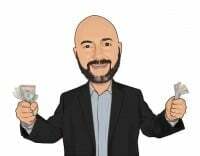 Monthly income averaged $5,823 in the January-June period of last year, growth of 145% over the $2,375 I earned in the same period the year before. Income for the first half of this year has averaged $6,402 which is just 10% higher than last year. That’s not bad for a work-from-home business but the growth in income is definitely concerning. 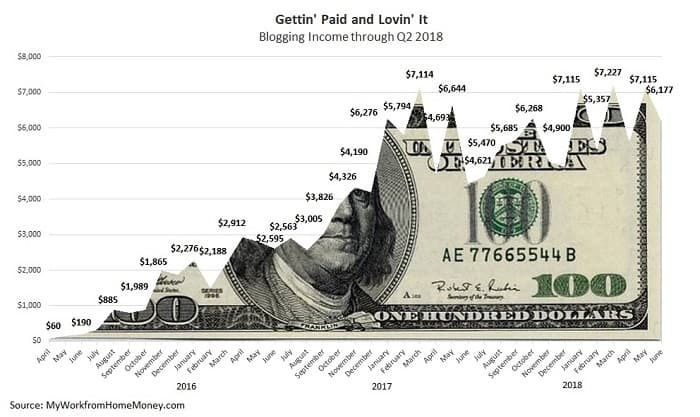 To see why blogging income growth has slowed down, you only need to look at the pace of new products and monetization this year versus last. In the first six months of 2017, I released three new books and hired an assistant to find sponsors for article. Just those two actions meant an average $1,400 a month extra versus the year before. Compare that with the pace of monetization this year when, in the first six months, I haven’t released any new books or products. Affiliate sales and sponsorships are up a little just on the jump in website traffic, but I haven’t done anything to really boost either. Let me just say that a 10% pay raise would be awesome in any traditional job but I know I can do better with an online business. That’s really the point. It’s not the pace of income growth for your business but the hard look you need take regularly to ask yourself if you can do better. You have to be brutally honest and call yourself out if you’re caught slipping in something. I’m loving the new YouTube growth, but you can’t let one aspect of the business distract completely from something else that’s also important. You’ll have that from time-to-time. You’ll get excited about a social media channel or about your email list. It’s great to get excited but remember, as an entrepreneur, you have to play marketer and manager and accountant (as well as a million other roles). Don’t let any one of these roles become your sole focus. The fact is that you’ll always want to grow your traffic ‘a little more’ but traffic without a profit plan is wasted. 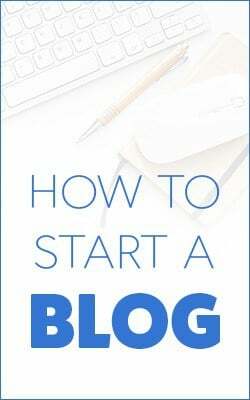 Considering that more than a third of your blog visitors bounce from your website after the first page and may never return, you need a plan to make money on every single page. Integrate product development and new revenue sources into your content calendar. Try writing at least one new affiliate review each month and schedule time each week to look for new affiliates related to your blog. Sit down each quarter to plan out a series of blog posts that can be reformatted into a book later. Have a written profit plan that outlines your sources of income, which ones have the most potential and ideas for development. Create profit goals for each source and detailed action steps to reach them. Don’t be afraid to make money! Your blog is a business and a valuable online asset. There will always be haters that don’t understand the online world is just as much a business as the offline or that will question your motives. You’re providing a service to your audience and deserve to be rewarded for that service. It’s tempting to break your blogging rules and to get lazy in one role or another. Remember, this is a business and treating it as such means devoting time to all business roles. Find your motivation where you can but don’t neglect one part of the business for another. Create goals for each aspect in your business and persevere to beating them!